Dental implants are titanium posts that are surgically inserted into your jawbone to act as an artificial tooth root. 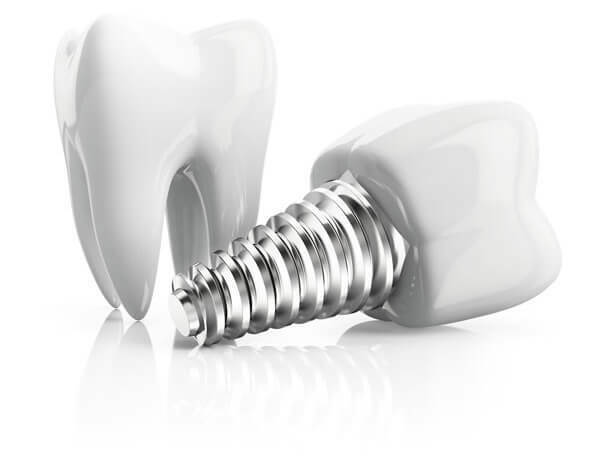 Once in place and healed, the implants are topped with an aesthetically pleasing dental crown. The first step in the dental implant process is to assess whether you are a good candidate. To do this, your dentist will discuss your general and oral health history. If you have advanced gum disease, some blood disorders, certain bone diseases, or poor quality of bone, you may not be a good candidate for dental implants. To assess the state of your bone a three-dimensional CAT scan is often the tool of choice. It gives the dentist detailed image of your jawbone, nerves, sinuses, and adjacent teeth, and helps with precise planning of your dental implant procedure, because it takes away any guess work of where the implant should be placed. It will also help to determine if there is a need to add artificial bone material to an area where the bone density is compromised. Once the implant is placed it needs time to heal. As it heals, your jaw bone grows around it in a process known as osseointegration. This typically takes 4-6 months, while the implant becomes an integral part of your body, as it fuses with your jawbone. Once osseointegration is complete, the implant is topped with a dental crown. The most obvious impact a missing tooth has is aesthetic. There is no arguing missing teeth can affect the look of your smile, and, for many people in today’s world, physical appearance can impact self-confidence. But it’s not just about the unappealing gaps left behind by missing teeth; beneath the surface, there’s something else going on. Underneath your teeth lies your alveolar bone. This is the ridge of bone that contains the tooth sockets. Below that is the jawbone proper. All bones needs stimulation to maintain density. In the case of your alveolar and jawbones, this stimulation normally comes from your teeth. When teeth are missing, these bones can lose width, height and volume. Since your teeth and jaws also act as the structural support for your face, jawbone loss can change its appearance causing that sunken in “aged” look. Jawbone loss can also impair your ability to chew and to speak. Finally, the gaps left by missing teeth can be hard to clean, putting you at a higher risk for tooth decay and gum disease. Additionally, the space created by a missing tooth can cause other teeth to shift and drift.